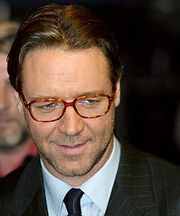 Russell Ira Crowe (born 7 Aprile 1964 in Wellington) is an actor frae New Zealand wha is a lang-term resident o Australie. He is kent for his roles as Decimus Meridius in Gladiator and as Jor-El in Man of Steel. This page wis last eeditit on 8 Apryle 2019, at 23:06.